Electric blues, mustard yellows and pale pinks come together in a plethora of textures and shapes in Finnish artist Man Yau’s ceramic sculptures. 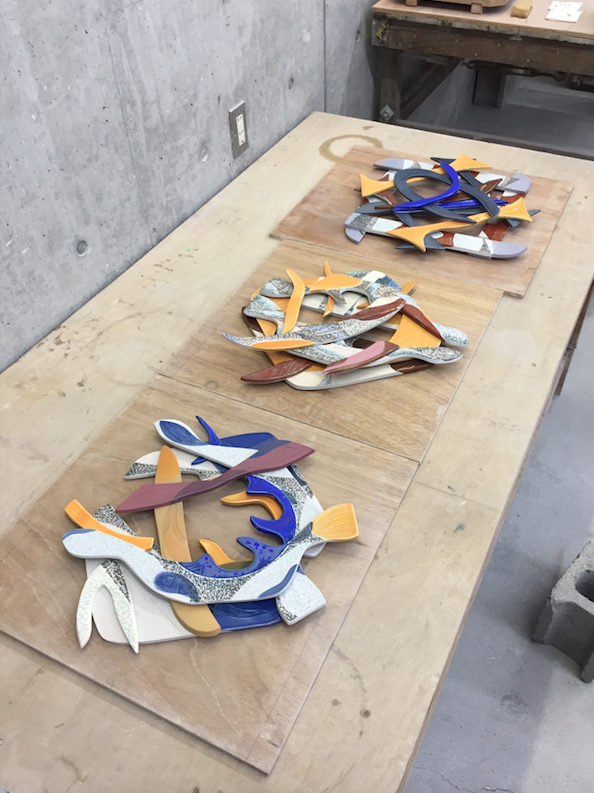 Assembled as a kind of 3D collage, the sculptures were created on a residency in Japan’s Shigaraki Ceramic Cultural Park (SCCP) as part of a program by the Finnish Institute in Japan. 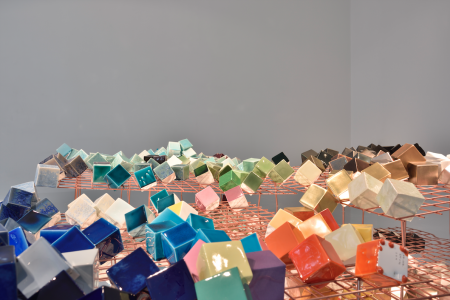 The works show the technical skills and glazing experiments that Yau developed over her six weeks in Japan, as well as encompassing hidden stories and symbols in their shapes and engraved sentences that reflect on her experiences as a ceramic artist and time in Japan. 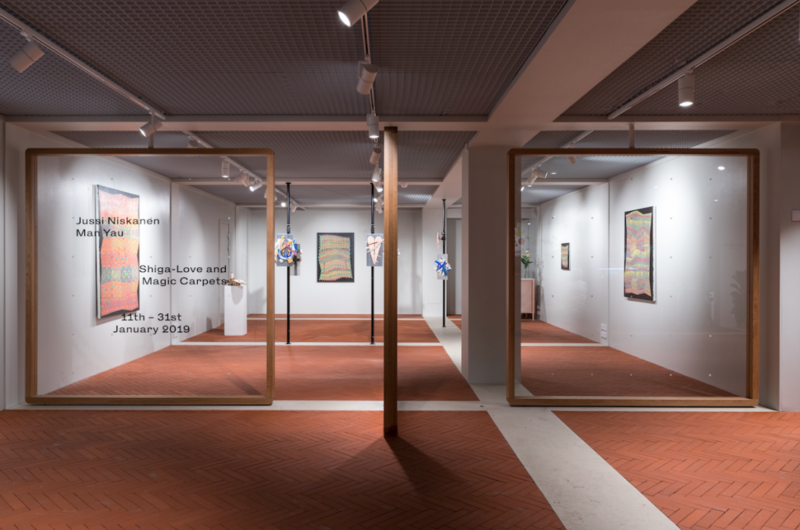 TLmag: Your current exhibition Shiga-Love and Magic Carpets is on display at the Kämp Garden in Helsinki, Finland. Could you tell us how this exhibition came about? 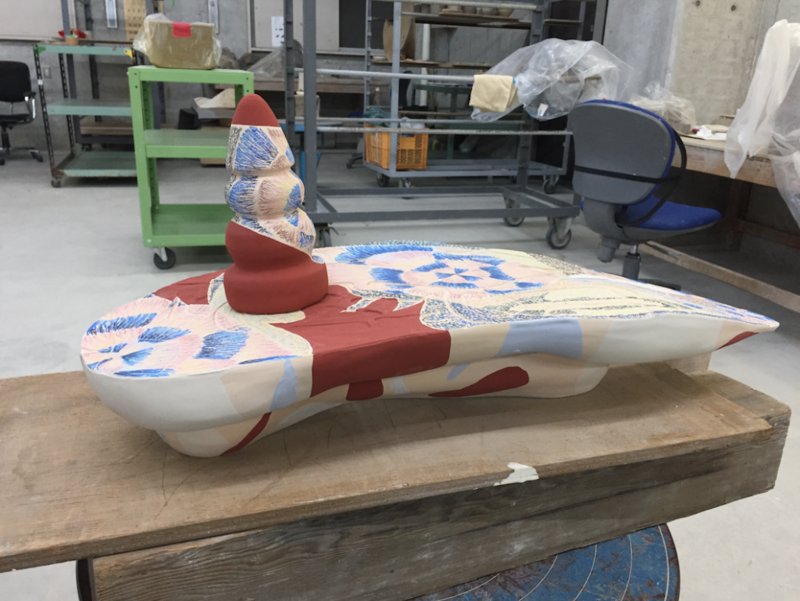 Man Yau: I got accepted for the residency program that is created by the Finnish Institute in Japan in collaboration with the Shigaraki Ceramic Cultural Park and before that, I was not sure if I was going to have the exhibition show this results in Finland or in Japan after the residency. When I first arrived at the residency, in my initial project plan, I had planned to make 1-3 sculptures maximum because the residency was only for six weeks which is a fairly short period for making ceramics. But I don’t know what happened, for some reason I ended up doing 12 works! At the same time, while I was still in Japan, the new concept department store called Kämp Garden called me and they said ‘we have one gallery space here and we would like to have your exhibition as our first exhibition here’. So, since I was quite productive during the residency I agreed to show the results of what I created in Japan. The show is a collaboration between yourself and Jussi Niskanen was this part of what Kämp Garden suggested for the exhibition? 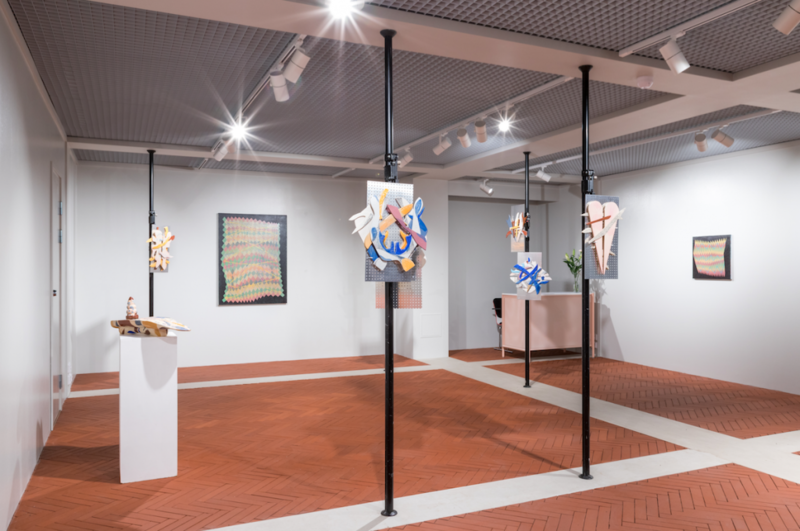 Because the invitation for the exhibition came at such short notice — I think they called me in November and the exhibition started in January — I asked them if I could have a joint exhibition together with my husband, Jussi Niskanen. He is a painter and we have had collaborations before and I thought it would be a cute idea to show our works together and that is how it all came about. 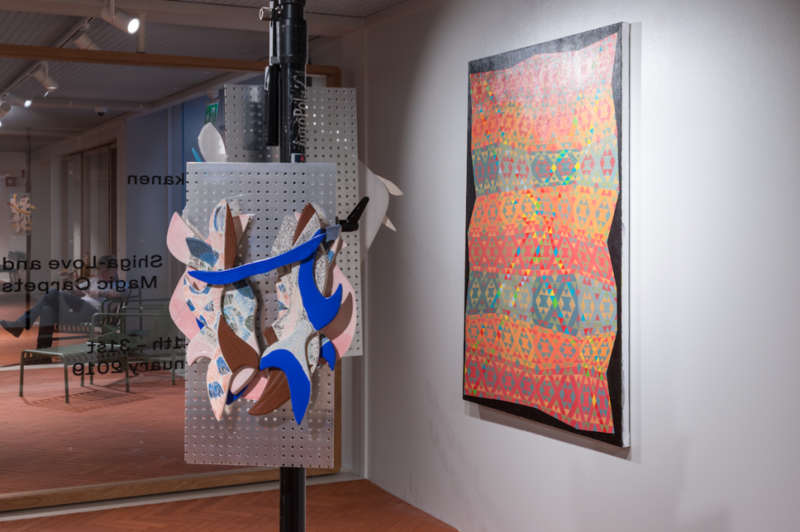 How do you see the relationship between your sculptural works and Jussi Niskanen’s paintings? I would say in general we have quite a similar philosophy of making, meaning that both of us use quite geometric shapes and that we arrange things in a logical order. Also in the way we work, we both have processes that are very time-consuming. 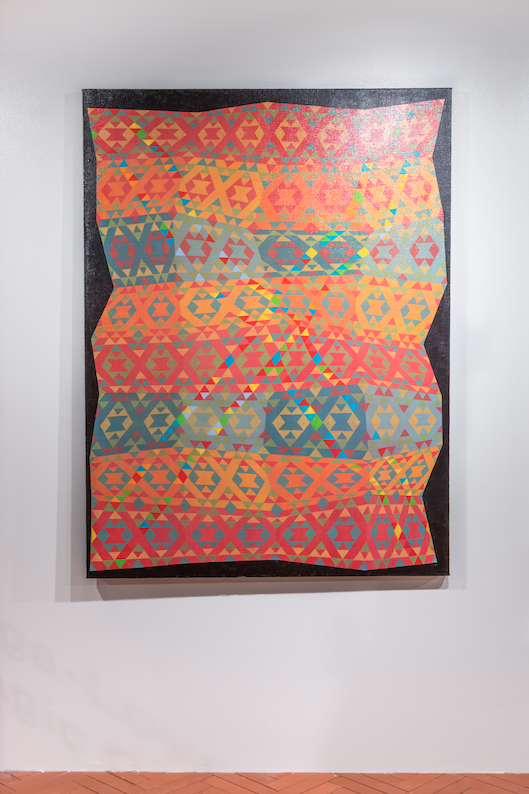 My husband repaints a painting every day for two months in order to make just one work. It is similar to my work in that sense because the glazing technique that I use means that I have to refire and refire my ceramic sculptures many times in order to get the final result. If I look at the works in terms of just a visual outcome, I see that they fit together quite nicely. 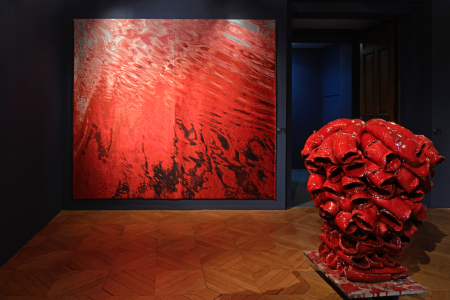 It also seems that color plays a key part in both of your works, is that quite an important part of your practice? Yes, it definitely is. Color is important however when I start sketching a new sculpture I am not thinking about the fact that it needs to be colorful. It is just the style of how I do it and the aesthetic sense that I find appealing when I do sculptures. How did the experience of working in Japan differ from your how you work in Finland? The impact of being in Japan was huge in my work. My older ceramic works have almost this hygienic way of glazing the ceramics, using very even glazing on the surfaces. In Japan, because it was a completely new environment for me, I could get inspired very easily. Even going to a grocery store and seeing the way things have been packed or just the everyday products was inspiring. It was funny to see how much of an impact everything had. Also, the Shigaraki Ceramics Cultural Park is a really well-known place and now I know why. There are amazing facilities and it is located at the top of a hill where you can see basically the whole city. It is quite hard to imagine before you experience it. I felt like I did not have that many limits there, like I could do almost anything, except the timing. I also did a residency in China last year and I think having done two trips to Asian countries in the last year has really had an effect on my work. In your proposal for the residency, you said that you wanted to make use of the big kilns of the sculpture park to realize large scale works. However you ended up making quite small-scale pieces, what changed your mind about how you wanted to work? In my initial project plan there were three aspects – the size, combining different materials with ceramics (which is something I also do here in Finland) and finally, I wanted to study the Japanese culture in general. But once I got to Japan I realized that the whole city of Shigaraki is only about ceramics. There are lots of ceramic studios and I realized that there is such an extended knowledge about glazes and materials that I do not have access to in Finland in my ceramic studio. So I decided that I wanted to put all my energy into the glazing techniques. As you can see in the works, there are many layers look as if they are glued together. 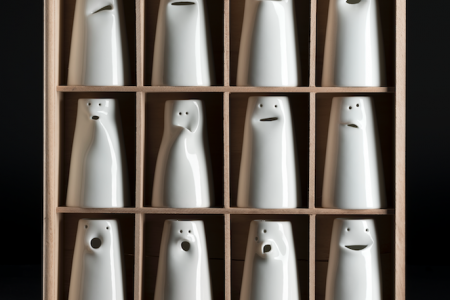 I really wanted to put a focus on how to develop that technique in order to keep the ceramic quality — meaning that I do not add any glue or any additional things that are not ceramics. Another reason was the timing. 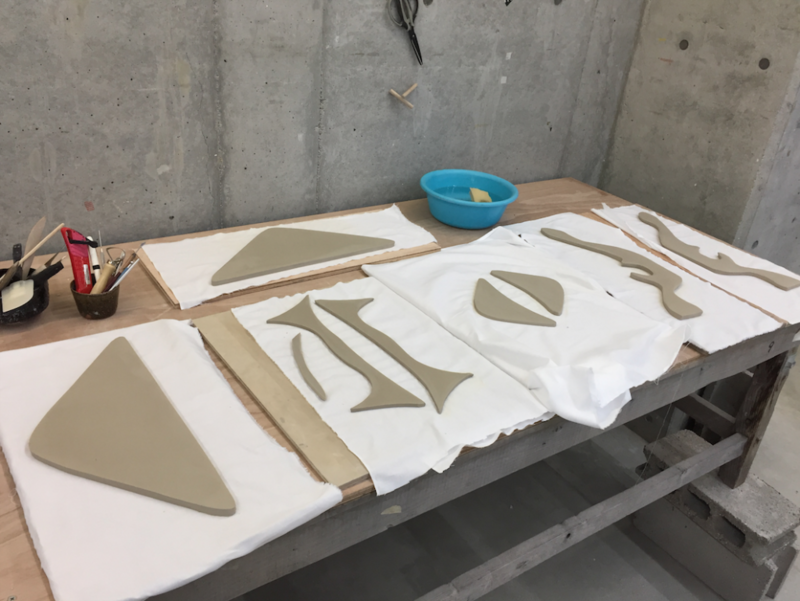 I realized that if I wanted to make a finalized sculpture in the period of six weeks I would only be able to produce one big piece. I was reflecting on the outcome because I like to make big sculptures, In the end I am happy that I decided to focus on these specific details because I felt that I really learned something and now I know how to use that technique well, rather than just making something really big that was based on something I already knew. Could you imagine scaling this technique up in the future then? Definitely, I actually started to talk to the director of the residency that about returning on my own, probably at the end of this year or next year, and I would focus on the same techniques but on a larger scale. That would be super nice but I also have no idea how this will work if I scale it up into something bigger, but that is something I would like to find out. Could you explain a bit more about the techniques you were focusing on developing? I would say I learned two kinds of techniques. The first is to do with glazing. On the pieces, it almost looks like the surfaces have been done with crayons or pencils but it’s actually a glaze. I have been trying to do that for a long time but it is difficult because usually if you use underglazes you always have to put a transparent glaze on top of it in order to keep the color in the surface. 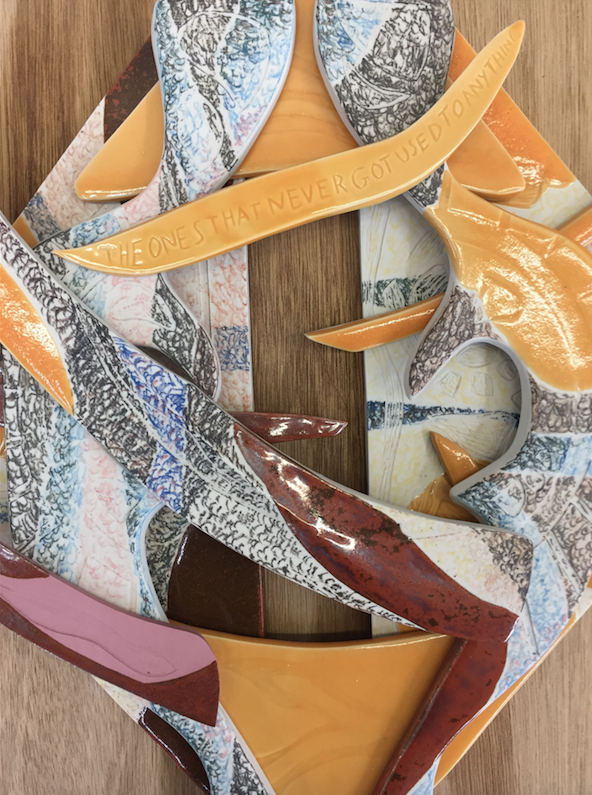 During the residency, I learned how to do it without the transparent glaze so I could keep the surface matt and so that the color itself stays at the surface. The other technique was the “gluing technique”. This meant that I had to finalize each layer separately in high firing and before this, I had to do many bisque firings. Then, after all this, I would do another firing which was a relatively low-temperature high firing but not too low because otherwise, the separate pieces would not attach to each other well enough. So basically I found the right glazes at the right temperatures to join them in the kiln. 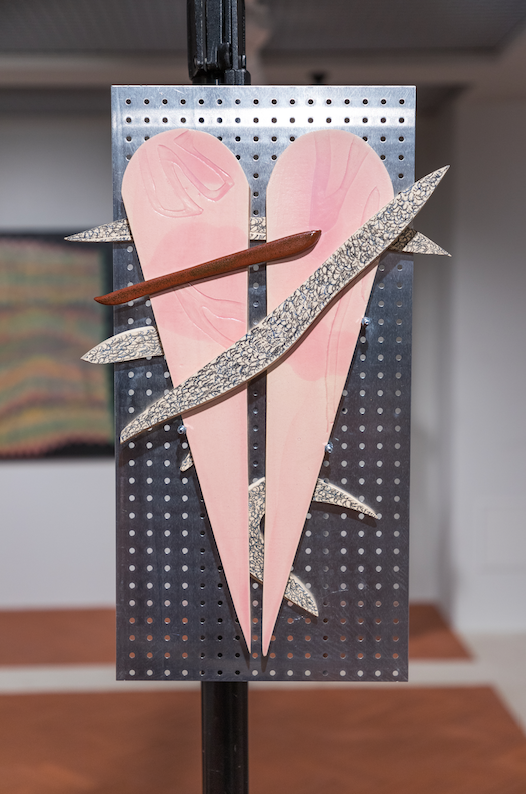 In terms of the concept behind the pieces, I was reading that each section of the sculpture references something quite personal in your experience of being in Japan. Could you explain a bit the thinking behind the pieces? Like I said, in my initial project plan I had thought that I would be making really big sculptures but then once I got there and I realized the technical possibilities of the glazes and I decided to transport the idea of a physical size into timing. Because time is such a big thing and it can include so many experiences, years, events etc. and I felt in this way I could still deal with this idea of “large scale”. Once I got to Shigaraki, it reminded me of the same experiences I had when I first started studying ceramics — how excited one could be learning new things and that everything revolves around the material. So what I did for the sculptures was to take some elements from my past which could be directly from an artwork that I have previously done or it could have been based on a place. For example, I lived in New York in 2014 and so there are some elements or hints to that period in the piece. One of the advantages of being on a residency in a new place is the opportunity to meet people different than yourself, I was wondering if there was a person or group of people who make a big impact on you? 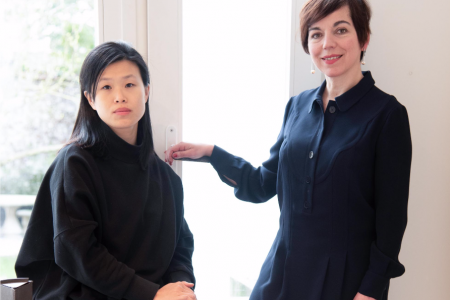 Man Yau’s Shiga-Love series will be part of Spazio Nobile’s Finnish Season that will take place from March 2019 until March 2020.